L'nL Battle Generator with my own rules. A few weeks ago I posted a review of Lock 'n Load's new Battlefield Generator for their recently released Russian module (Heroes of the Motherland) boardgame. As part of the review, a scenario was generated, which gave a compact one mapper game with relatively few forces. The scenario worked out quite well, so I have used it as a basis of putting a miniatures game together using Kallistra 4" hexes and Pendraken 10mm figures. This post gives an overview of the resulting 'mash-up'. I have my own hex based tactical rules for miniatures - called Tigers at Minsk (freely available - see the Resource section). They are designed to be relatively simple, use a small gaming area and be solitaire friendly - so I thought I would have a go at re-running the Lock 'n load scenario I recently generated, to have a quick fun game ready for Mike on our next face-to-face meet. He had already played the scenario with the Lock 'n load system as intended, so I was interested in seeing what he thought of this mash-up. Also the post highlights how this battlefield generator can work for other systems. Setting up - The scenario generator used map 47, which is generally an open map comprising of farmland and woods, which I replicated with Kallistra's Hexon II tiles. The Orders of Battle - In Tigers at Minsk (referred to as TaM here-on-in), an infantry base represents the entire section, including the inherent LMG's, so the first thing to lose from the generated scenario were the two independent LMG teams that both sides had. In TaM, Panzerfausts are represented by an allowance rather than an actual presence of the table. Our scenario had generated 3 panzerfausts, so these were converted to an allowance rating of 3. What this means is that when the German player wants a section to use a Panzerfaust, they roll a die against the allowance to see if one is available at that time. If they score 3 or less (i.e. their rating or less) then the unit can use a panzerfaust and that rating is preserved, but if they fail their roll, they don't get the weapon and the rating drops 1 level ( to 2 in his example), making future attempts harder, until of course the rating drops to zero .... no more panzerfausts! The only other change relates to leaders. TaM does not use leaders, but does have hexes that are either in or out of command, with some hexes that are automatically in command at the start of a turn. The scenario generated had invested in making the German leadership notably better than the Soviet side, so in our game, I reduced the Soviet automatic command function to 1 central hex plus 1 adjacent hex (instead of the normal 2 adjacent hexes - this is a better option game wise than increasing the German command allowance), so all other friendly occupied hexes that don't automatically get command would need to test for command, giving the Germans an edge with command. The scenario called for a German sniper which are quite powerful in Lock 'n Load. To emulate this, in the TaM replay, every time a Random Event is called for, the Germans will automatically get event number 3, which is the Sniper Event. The Soviets will still select their event randomly. The Soviets were given a morale value of 6 and the Germans 5 ( a factor based around how many units a side starts with, this is a TaM feature and not a requirement of the original scenario). In TaM as a player takes losses, their morale drops, once it hits zero, all units must individually check to see if they fall back. This can disrupt an attacking force and can prise defenders out of important positions. They check again on every subsequent loss. The Soviets will get 9 infantry sections (equivalent to a company of men), 1 artillery module (with an on-table observer), 2 anti-tank rifle teams, 1 T34/76 tank. The Germans get 6 infantry sections (equivalent of two platoons), 1 HMG, 2 StuG III's, a panzerfaust rating of 3 and a sniper benefit. The Map / Table - In the generated scenario, map 47 (shown below) was chosen and the game was played longways down the map. This meant setting up the table in a similar way, with the hex grain running wide edge to wide edge. The map was emulated exactly, except I lost the half hexes on the start lines, but that didn't make too much of a difference as TaM has very low movement rates and I just set up within 1 hex of the board edge rather than the 2 hexes required by the original scenario. On my board to replicate the map terrain, heavy woods have 3 trees per hex. Light woods (two trees per hex) will be treated as orchard (like woods but vehicles can freely enter) and scrub (one tree and one dead tree stump per hex) will be treated as rough (variable line of sight through the hex a little bit like the hindrance type rules that tactical games use, except in this instance, before shooting you test to see whether or not you actually get a fleeting glance of the target). This is a meeting engagement with three of the hexes counting as objectives (see the white crosses in the above setup). Both sides start at their respective edges of the table (Russians on the right - above) and play longways down the table (side to side in the above photo). The Soviets have the initiative, so will take the first part of the turn. 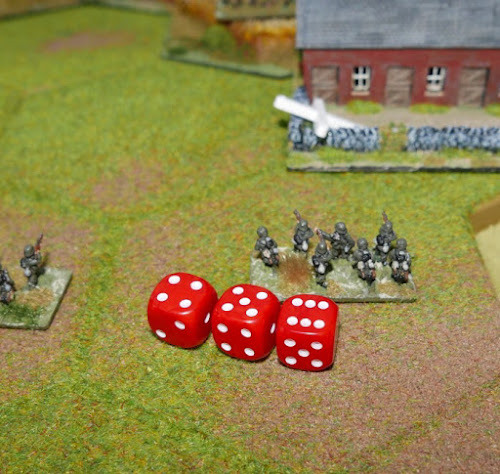 The Germans will be given the 'Advantage Chit', so they can put one out of command unit back into command if they need to (they then hand the chit to the other player who can then do the same thing when needed, the chit can go back and forth during play). Russians setup first. 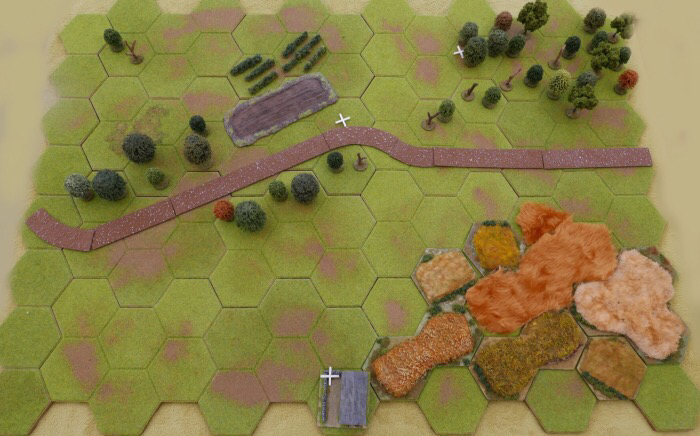 Two strong infantry forces are set on either flank with the T-34/76 going up the centre of the board (see below). Just to the right of the tank, you can see the artillery observer. They are always in command an always count as being in cover. Germans setup second. There are three attack formations (below). On the left the StuG's and an infantry section will give covering fire as targets present themselves. In the centre, two sections and an HMG will advance under cover of the strip of orchards that line the road. To the right, one platoon (three sections) is spread out and will advance to capture the building. Turn 1 - TaM uses a game clock as part of the turn system, so we will start the game at 10 AM and decide now that it will end as soon as an hour has passed, I think that will probably allow a similar amount of action to unfold as the original scenario did. This scenario is essentially a race to get to the objectives first, so being in command and able to move is important. The Russians are nearer to the objective in the woods and just about nearer than the Germans to the building, so they have a game advantage. Turn 2 - 1005 hours. Under cover of the fields, the Russians bunch up to ensure they are all in command, they want to get to that building without delay. The German left (below) goes out of command (OOC from here-on-in), but everything else advances. Turn 3 - 1011 hours. A random event is rolled. The Germans get their automatic sniper attack, but they can't use it as there are no enemy infantry in sight. 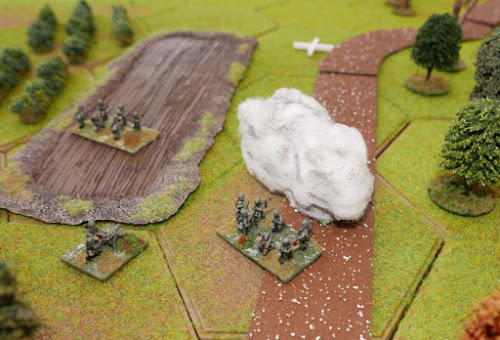 The Russians get air support, which makes a failed attack on one of the StuG's. 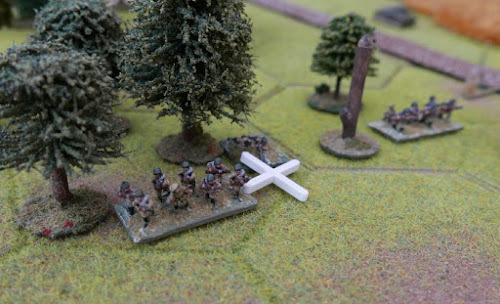 The Russians reach their first objective (below) on the edge of the woods. Turn 4 - 1018 hours. The Russians are starting to get to the edge of the field and together with their positions at the edge of the wood are now able to fire at the Germans with small arms over open ground. The German centre is 'target rich' (multiple units per hex) so are lucky to survive the fire without effect. 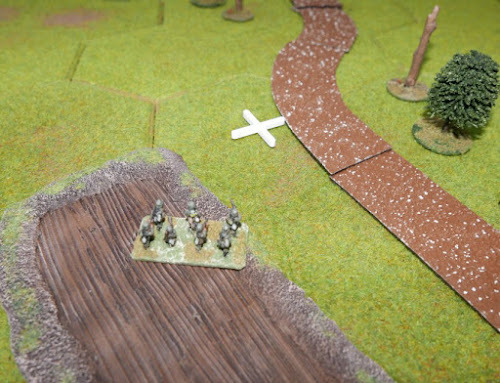 In an effort to get across the road into the woodland, a section lays smoke before movement (see below), but they fail their smoke retention roll and so no further smoke can be laid by the German units during the game - worse the smoke just placed actually disperses in the same turn. A StuG (the other one is OOC) gets a sighting of the T-34, fires, hits, but just causes a stun (stunned vehicles cannot do anything until they recover), the Russian player feels somewhat lucky to have survived that! Turn 5 - 1024 hours. Another random event. The Germans get their sniper and hit a Russian section that is approaching the house via the fields, pinning the unit. The Russians get 'HQ suppression' which means in their turn everything must test for command, rather than some things getting automatic command. This is an amazing stroke of good fortune for the German player. The Russian sections were nearer the house and would have reached it first, but those sections then went out of command because of the random event and effectively stalled, plus one is pinned so can't advance anyway. The first casualties of the game fall on the Germans in the centre, their section takes two pins (see below), which removes it from play. The other two nearby units go OOC. The StuG's fire at the T-34, but the best they get is another stun, which has no further effect. Turn 6 - 1027 hours. The German sections move closer to the house and will take it unless stopped. The Russian artillery observer calls down accurate fire on the lead section (see below) and gets two hits (5's and 6's in the open) removing the unit from play. That was all rather lucky for the Russian player. 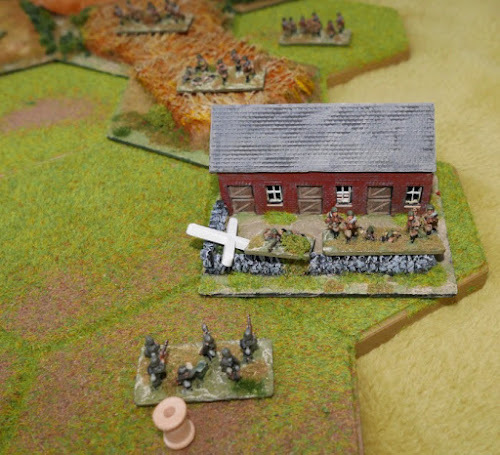 German morale lowers with the loss and with their lead unit gone, they are now effectively one hex further away from the house, so the positional advantage swings back to the Russians, who will be able to get to the house in their next turn. The T-34 still fails to recover, perhaps they have some transmission damage, or one or more of the crew are wounded or concussed. Fortunately for them, the StuG fire is abysmal - perhaps they are fresh out of cadet school! Turn 7 - 1031 hours. Overall, the game clock has been moving quite slowly so far. The Russians take the house (see below), this is the second of the three objectives taken. Both StuG's go OOC (again! ), the German player can only sigh, while the Russian player lets out a gasp of relief. The German HMG pins both enemy units in the woods ahead and the Soviet player instantly feels they are sorely missing a HMG of their own - they should really have bought one during the scenario creation. The German situation in front of the house is becoming desperate (see below). Turn 8 - 1040 hours. The Russians reinforce the house and any prospect of capture for the German player slips away. The T-34 remains stunned and the (apparently) inexperienced StuG crews continue to be incompetent. It is really unusual for vehicles in this system to survive for so long in these circumstances. I would have expected that typically the T-34 would be gone by now, perhaps getting off a shot first and taking one of the StuG's out, but it is not to be and in truth, the tension adds excitement to the game as the 'most likely' doesn't seem to happen each time the dice are rolled. Turn 9 - 1050 hours. The Germans in front of the house start to fall back, but are suffering grevious casualties. By the end of the turn they are removed from play. 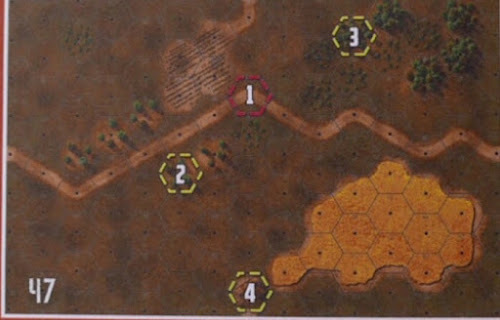 With this area secure, the Russians start to move from the fields across the open ground towards the woods by the road (see below), as they can't be seen by an enemy and are in the open, they get to move 2 hexes. The T-34 absorbs another stun result! Turn 10 - 1057 hours. 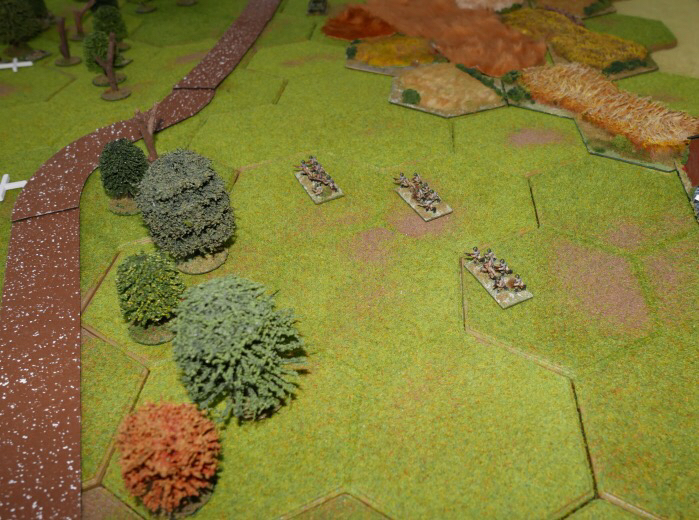 The Russians get amongst the light woods, with 1 section being just a move away from the final objective hex on the road. It gets the full attention of a German rifle section and HMG, resulting in it being removed from play. 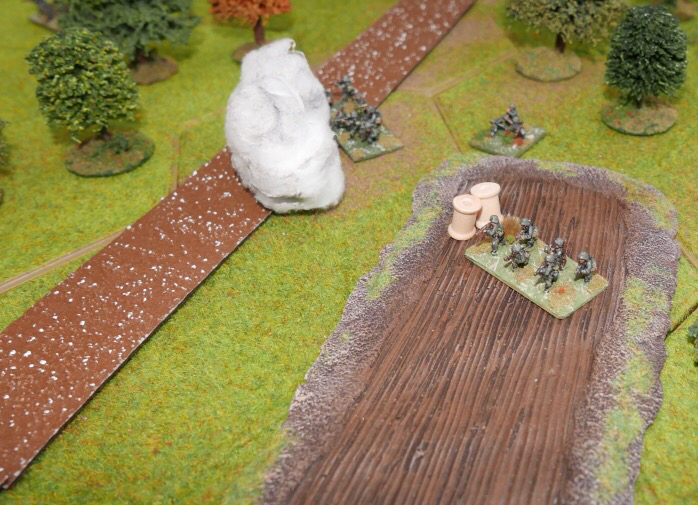 Another German section (see below) pushes on through the field and is now just 1 hex away from this objective. Turn 11 - Calling TIME as the clock advances to 1104 hours, so more than an hour has been played. The game ends. It is a Russian win with 2 out of the 3 objectives taken by them, also the overall situation strongly favours them, especially as the German morale level is now so low. With more time available, they would have got a full victory. Playing extra time !!! I can't help but play an extra turn, just to see what happens - All Russian rifles open up on that lone German section (see above) and remove the unit from play. German losses have been so great that their morale crashes to zero and so all remaining units must take a morale check, those that fail will fall back one hex. 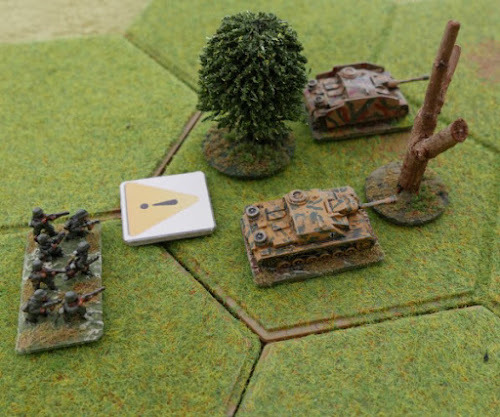 One of the StuG's and a German rifle section fail and fall back. The T-34 comes to life and gets a round off against a StuG, but haste makes the shot miss by a wide margin, but return fire is equally poor ....... no surprises there then! What can I say about that tank duel, it was most unusual and it was just as likely that the first or second StuG shots would have knocked out the T-34, but all the failures collectively raised the game tension as each die roll was made. The Germans have quite a bit of open ground to cover, so they need the StuG's to get rid of the T-34 and then start supporting an infantry advance. There were several potential turning points in the game that could have sent things in a different direction. The early air attack against the StuG could have knocked it out, perhaps followed by a T34 triumph. The artillery strike in front of the house was accurate and effective, it could so easily have been innacurate or not effective and the Germans would then have reached the house first. The armoured duel should have been more decisive ... one way or another! and the Germans could have retained their smoke allowance for longer and their one smoked hex dispersed quicker than is typical - so plenty of small twists that could make this replay in a different way next time. Anyway, I will certainly be using Lock 'n Load's Battle generator again for my figure games. It would also be visually nice to run the game with the figures and terrain, but using the Lock 'n Load ruleset and game markers, which is easily done without any conversion requirements since I am already working with hexes, but that is for another day. A post that compares several tactical systems, including TaM LINK HERE. The post that covers the Battlefield generator and the resulting AAR LINK HERE. Thanks very much for that posting, it was very interesting and has inspired me to give these rules a go. Good stuff Norm, and, as you said, different! Three AFVs, but none knocked out, that's awesome! To me, rules that can have that sort of outcome are much preferable to the regular 'line them up and they tear each other apart, and the remaining infantry may as well not even be there' type. thanks for posting gents. I hope the rules meet your expectations. Jack I am just partway through reading about your one Hour wargame with Napoleonics, very good. I added a rule that caused units to test after taking casualties, If the failed, they took an extra 2 casualties and fell back 1 move. There are 3 1HW posts on this site, which may be of interest to you ... See the fist line on the labels list. I really must bit the bullet, get some Pendraken 10mm WWII and give these rules a go (plus a couple of other sets I like the look of :) ) Thanks for the report. Really enjoyable post. The Panzerfaust rule mechanism is very neat and especially useful if playing solo games. Thanks, the rules are pretty straight forward and have had a lot of play testing, so everything seems to work quite smoothly. I do like the PzFaust mechanic, which of course apples to all similar weapons like piat, bazooka etc. Great stuff, Norm. I picked up a copy of the Battle Generator on this trip to the UK, and am looking forward to giving it a go. If I ever get my 15mms painted up, I may well try the L&L rules. I also got Cross of Iron (following your blog comments). The activation system is clever, and merits further study. I did not like the rest of the rules very much - at least on first read. While I dislike too much 'shoot and destroy', the Cross of Iron combat system seemed to make infantry units immune to destruction, even if they were caught in the open at point blank range. I really like what you've done here using the LnLP battle generator and adapting it to your own ruleset & minis. I'm not really a minis guy, mainly because I don't have the time to paint them. Also I was thinking of doing something similar, using the battle generator and LnLP's X-Maps with my ATS/ASLSK counters along with a simple rules set (e.g your TaM or the rules from the book you reviewed "One Hour War Games"). I do have all of LnLP's published BG and X-Maps (except for Heroes of the Motherland) and I am inspired by your blog to continue my version of a "mashup". Keep up the great work and thanks for the inspiration. Hi Ellis - I agree with you view of Iron Cross, it is nice to own and to read for ideas, but would not be my 'go to' set. I also think the activation system might be better suited functionally to a boardgame, because it is easier for counters to carry around markers with them, then having small scale vehicles doing the same ........ Though I know you are not a fan of counter clutter - it seems a nice idea that has an administrative burden. Dave - I am really surprised that there are not more 'mash-up' ideas floating around the tactical community. years ago, Retro (from Minden games) did a superb job in getting people dusting off old ASL modules and the new L'nL X maps could be used with several systems, with or without the Battle Generator. I would obviously be happy to see you have a dabble with the Tigers at Minsk rules. Sorry about the duplicate post so I deleted it. I agree about "Retro" and acquired it quite a long time ago. I still use it even for SL or ASLSK from time to time. I just can't get into full blown ASL and the associated chrome it provides. I enjoyed reading the AAR above and would like to try your TaM rules if they can be modded for west front/north africa vehicles and squads. To date, the number of requests for N/W Europe 1944 suggest that I should look there next, it just needs me to collect and paint the models, the rest is relatively straight forward.